This Christmas (2015), i’m not sure now whether it’s this Christmas or last Christmas but, anyway! for Christmas 2015 I was lucky enough to be given the Yankee candle advent calendar by my boyfriends mum. I had always dreamed of getting fabulous calendars ever since I was a little girl. Back then though all I wanted was the Polly Pocket Advent Calendar, i’m not being ungrateful but i’m actually not sure why I never got it, perhaps it was my mum making a stand trying to keep Christmas about the real reason but, who knows. I’ll ask her one day. Anyway! 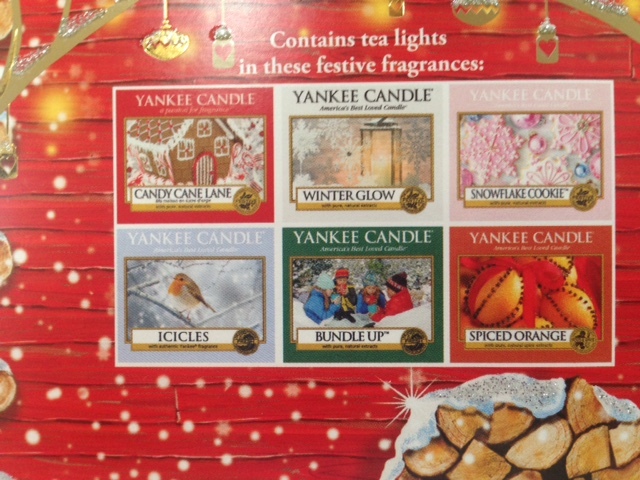 this year, as I had just lept in to my 20’s I was gifted the Yankee Candle Advent Calendar. My boyfriends mum knows how much I love Yankee Candle so it was such a thoughtful gift. My initial reaction was ‘Oh my god, this is the best thing ever’. It was red and had little windows, and it was already oozing with the smell of Yankee candle (the kinda stuff dreams are made of). Bear in mind I knew about the calendar since around November time so, the struggle was real keeping myself from prying it open and seeing what each day was going to bring. However, I didn’t not because I have incredible self control but, because it was locked away from me. As you can see from the picture above it’s actually quite tall. I have an average sized hand (I hope ) and as you can see it still rises a good few inches above my hand. The actual calendar contains 23 tea lights and one votive candle. I had only ever had the Sugar cookie tea lights before so, I wasn’t too sure what to expect and if the burn time would be great but, it surprised me so much. I used to light one a day over Christmas in these cute little tea light holders my mum got me next to my computer. My room is quite big, with a ton of windows and of course although the smell didn’t carry around the whole room, it did make my desk and the small surrounding areas around me smell of whichever tea light I was burning. Above are the candles my Yankee candle Advent Calendar came with. I had never actually tried the majority of them so, it was so nice to try them out in tea light form before deciding if I wanted to purchase them in full. The votive candle I received on the 24th was the ‘Christmas Eve’ candle. I had this Yankee Candle in a large jar last year and I absolutely adore the smell! I truly can’t think of anything bad to say about this calendar. You might think it’s because I was gifted the calendar but, I honestly thought it was such a lovely change from chocolate and made me smile everyday to think I could have a new Yankee candle every morning! Overall it was one of the most thoughtful gifts I received over Christmas. It was a pleasure to open everyday, even if my doors were a little loose!? or for an amazing price in the US by clicking here! If you haven’t already I also made a post on my favorite Yankee candle smells and the collection I have you can check that out by clicking here. I hope you enjoyed my post on Yankee Candle Advent Calender Review if you did please let me know in the comments below!